The Royal Family cost every person in the UK 69p last year - an increase of 3p on the previous year, Buckingham Palace accounts show. The total cost to the public of keeping the monarchy increased by £1.5m to £41.5m in the 2008/9 financial year. Palace accounts also show that the Queen dipped into a reserve fund to boost by £6m her Civil List, which pays for the running of the Royal household. It is the largest sum ever drawn from the reserve built up in the 1990s. The Queen's Civil List, which also covers Royal household staff salaries, cost £13.9m in 2007/8 - this comprised £7.9m from government coffers and £6m from the reserve. If the Queen continues to spend money from the reserve at the rate she is now, it will be used up by the start of her Diamond Jubilee year in 2012. 69p is an eye-catching figure. It's the sum royal officials proudly say the monarchy costs each person in the country. However, this headline amount doesn't include the large, but never disclosed security bill for protecting the royals around the clock. It's clear from these accounts that by next year, the Queen will have to go cap in hand to the government seeking an increased income. One of her annual pots of money, the Civil List, has been set at £7.9m for 20 years. In the good times, a surplus built up. For the past eight years, it's been raided and is dwindling. The £7.9m Civil List funds, among other things, £11m of salaries and catering. In a recession, with cuts on the agenda and an election looming, the royals face difficult financial negotiations in 2010. If the total cost of the monarchy is calculated per taxpayer and not per person, the cost works out at about £1.33 each. Of the £13.9m Civil List purse, nearly £10m went on staff salaries. 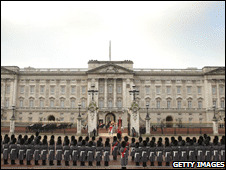 Housekeeping and furnishings cost £700,000 and ceremonial functions cost £400,000. A further £1.1m was spent on catering and hospitality - within this, garden parties cost £600,000, while the cost of food and the royal kitchens came to £500,000. Computers and IT systems cost £400,000 - double the figure for 2007 due to the launch of a new British monarchy website and new personnel, payroll and online recruitment systems. The £7.9m figure that is granted by the government was frozen in 2000, to compensate for 10 years of over-generous payments. It will be up for re-negotiation at the end of 2010. The current deal was agreed by Sir John Major in 1990. The shortfall has led to questions about how much Buckingham Palace will be able to ask for from the government during a recession. Last year Buckingham Palace officials described the cost of the Royal Family to taxpayers as less than the price of two pints of milk or an MP3 player download. But Graham Smith of the anti-monarchy campaign group, Republic, said the cost of the monarchy to the public was unjustified. He said: "Once again, the powers that be are continually putting their hands into the public finances. They are not being totally clear and transparent about how that money is spent. "This is a hugely expensive institution and we should be looking at massive cuts." Mr Smith said it was possible to run a head of state at a much reduced cost, offering as examples the Republic of Ireland and Germany. He suggested the Queen should be paid a salary of £200,000 a year. Mr Smith also said that dividing the £41m between each person in the UK to arrive at the 69p figure was really a means to make the cost seem less than it was. The £41m total does not include security provided by the police and Army or the ceremonial duties performed by the Armed Forces. The cost of Royal travel, which is also paid by the taxpayer, increased by £300,000 from £6.2m to £6.5m. The most expensive journeys were the long-haul overseas tours of the Prince of Wales and the Duchess of Cornwall.